The scandal involving German president Christian Wulff has been brewing for a month, The Age published just two articles on the topic, both reprints from The New York Times, both they don't go into the details of this failed republican representative: On 3rd January 2012 Wulff scandal a worry for Merkel and on 7th January 2012 Germany finds openness has its limits, a misleading headline, since it is president Wulff, who finds openness harmful. Christian Wulff was state premier of Lower Saxony before he managed - with some difficulties - to be elected German president. In 2010 it took him three rounds to gain a majority in the Federal Convention (Bundesversammlung consisting of all members of the Bundestag, and a corresponding number of representatives from the federal states). Though Christian Democrats and Liberals, who have been in a coalition government since October 2009, had a solid 21-majority in the Federal Convention, in the first round only 600 of the government’s 644 electors chose to cast a vote in favour of Christian Wulff, when an overall majority of 623 was required. In the second round his share improved slightly to 615. In the third round, when the absolute majority was no longer required, Mr. Wulff got his ticket to the Bellevue Palace by managing 625 votes (see: A president nobody knows - and no one wants) His predecessor, Horst Köhler, left office, “because he felt insulted and refused to face the public debate on his statements on Afghanistan. This discloses: The wooden Köhler did always try – and was not up to the job. ...” as The Süddeutsche Zeitung put it. The scandal swirling around Mr. Wulff arose on 12th December 2011 but goes back a couple of years and dates to the time, when he was still state premier of Lower Saxony. Early 2010 he had to admit to the state parliament, that had acted against the existing “ministerial law” that forbids members of the state government from accepting gifts. Mr. Wulff and his wife had accepted a free upgrade from a German airline from economy to business class. And he had accepted free accommodation in holiday resorts that were owned by his friend Egon Geerkens. In this context the Greens asked Premier Wulff, what other business relations he had with Mr. Geerkens. In a response to that question, he gave this answer: “Zwischen Ministerpräsident Wulff und den in der Anfrage genannten Personen und Gesellschaften hat es in den letzten zehn Jahren keine geschäftlichen Beziehungen gegeben.“ (“Between Premier Wulff and the persons and companies concerned there had been no business relations in the past ten years.“) This was formally correct, because the private low-interest loan of € 500,000 was granted in October 2008 by Mr. Geerkens’ wife and not by the business man himself. However, in the follow up to this story it came out, that the former shop assistant Edith Geerkens never had the means to provide a loan. It was her husband who had transferred the money to her bank account and to disguise the traces even more he insisted that Mr. Wulff should receive the money via an anonymous Federal Bank cheque. The Geerkens couple may or may not have gained political or business advantages through their relationship with Mr. Wulff and their loan, it was just one of a couple of "friendship" services Mr. Wulff received. The proximity to power seems to drive controversial entrepreneur Carsten Maschmeyer. He's the founder of the scandal ridden financial services firm AWD, his fortune is estimated at about € 650 million. That gives him plenty of money for a friendly favour or two. He's alleged to have donated € 330,000 to the election campaigns of former Chancellor Gerhard Schröder from the Social Democrats. His generosity wasn't tied, however, to one party or the other. He was apparently also willing to help out Mr. Wulff, who is a member of the Christian Democratic Union (CDU). Mr. Maschmeyer reportedly paid € 43,000 in 2008 to publicize the then-state premier's book titled "Better Tell the Truth, a title that is haunting him today." Mr. Maschmeyer claims, however, that Mr. Wulff was not aware of his financial support for the book. Financial Times: The sheep in the Wulff's fur. On 12th December 2011 Germany’s biggest tabloid newspaper BILD was about to publish the private loan story. Mr. Wulff, who was on a state visit in the Gulf countries and had given a speech on the freedom of press in Kuwait the previous evening, called the editor-in-chief of BILD and threatened legal action if it published a story on a private home loan he received at cheap interest rates. BILD confirmed media reports that the president had left a message on its chief editor Kai Diekmann's voicemail, in which he threatened the paper with legal action and expressed outrage about its plans to publish details of a private home loan that has prompted widespread criticism. After not reaching Mr. Dieckmann, he left a voice message. Mr. Wulff said BILD was going too far and had "crossed a red line" it would be a “declaration of war”. He complaint about what he called the "unbelievable story" about his € 500,000 loan. 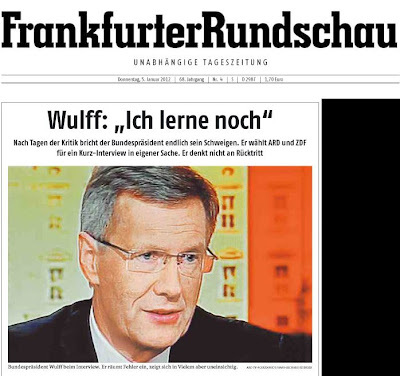 Wulff finally reached BILD’s editor-in-chief one day later, expressing regret over the tone and content of his earlier phone call. Mr. Wulff‘s office said last Monday, 2nd January 2012, that he greatly values media freedom and doesn't comment on private or telephone conversations. Headline: "Wulff really feels sorry for himself." 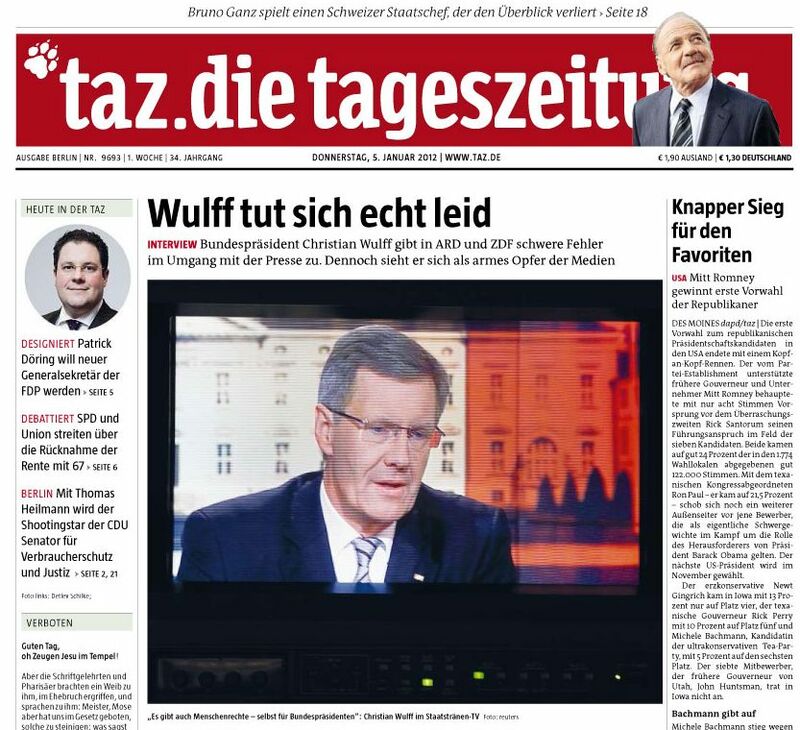 To contain the damage, Mr. Wulff granted an interview to two journalists from the public TV stations ARD and ZDF. He apologised for the message left on the voicemail, saying he had merely wanted BILD to delay the report for a day, which the newspaper actually did, but Mr. Wulff had withdrawn written answers shortly before the newspapers deadline on 12th December. Mr Wulff said in the interview was an effort to be open about what had happened. But Mr. Diekmann said in an open letter published on Thursday that Mr. Wulff had been less than forthcoming. "In order to prevent misunderstandings regarding the content and motive of your phone call, we view it as necessary to publish a transcript of your message," Mr. Diekmann wrote. He asked Mr. Wulff for permission to do so, in keeping with German laws regarding the privacy of personal communications. In his own open letter, Mr Wulff said no. "The words that were spoken in an exceptionally emotional situation were intended for you and no one else," he wrote. "I apologised to you shortly afterwards. You accepted this apology. That put an end to the dispute between us, and I believe that it should remain so." 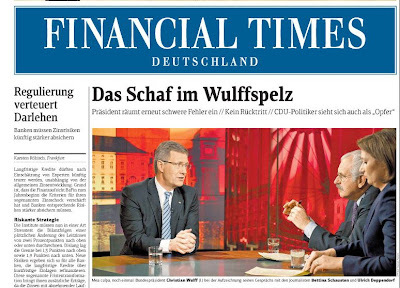 Wulff: "I am still in training"
In his TV interview Mr. Wulff (52) claimed he was still in presidential training ("Ich lerne noch"). Having assumed the post of president in July 2010, he still wants to be treated as an apprentice who is learning on the job – and that after a political life that started at the tender age of 16. He has never done anything else but be a politician. The best representative for a politicians’ republic, you’d think. In a Monarchy the heir to the throne starts his/her training at a very early age and not only, when they assume office. In 63 years, this system has only resulted in one actually worthy figure (Richard von Weizsäcker) being elected. I'm not sure whether this or the car crash entertainment of US elections is a better laugh. Of course, not every heir to a throne got the training he or she should have - often with unfortunate results. However, that could be remedied, at least in a constitutional monarchy, by prescribing an age at which, and a degree to which, the heir should be "apprenticed" to the reigning monarch. I agree with both of you. David, you are right: Richard von Weizsäcker was an exceptional president and I have high respect for him. His grandfather was the last royal premier of the Kingdom Württemberg and little Richard was born in the Schloß in Württemberg’s capital Stuttgart. Of course, Fr Theodore, not every heir was ready to assume royal powers. However, today’s crown princes(ses) would be good kings or queens. Prince Charles will be a good king and Crown Prince Felipe is able to fill his father’s shoes. Crown Prince Haakon, Crown Prince Frederik or Crown Princess Victoria received the best training any head of state could receive today. On the other hand you have King Constantine II of the Hellenes who ascended the Greek throne in 1964 aged only 24. Right from the start he had to deal with the old fox Giorgios Papandreou and his good for nothing son Andreas who was involved in dodgy deals and received fatherly protection in doing so. Against these two adversaries the young King stood no chance. The best preparation could not have helped him again their intrigues. Of course, I agree that the interregnum in Germany should end. Meanwhile, the interregnal government will continue to make a fool of itself. Thanks for this post, sir. On another note, although I hate to be picky, does Germany really have federal states? Is not a federal state as opposed to a unitary state, such as Norway? Does this not make Germany itself the federal state? And the common translation amongst the German-speaking of Bundesland into federal state an erroneous translation?